When I was in Israel in 2008, we went to the pool mentioned in this text. We stopped there for a bit while Dr. Robert Canoy, Dean of Gardner-Webb Divinity school and leader of our trip, led us in a devotion. Interestingly, a few months later, my pastor at the time, Dr. Guy Sayles, preached on this text. I’m indebted to these two theologians for much of my understanding of this passage. The Pool of Bethesda is huge. And since the water is all drained out now tourists can walk around in it, amongst the porticoes and down the stairs. You can see the Sheep Gate from there—the gate that the faithful would enter when bringing their sacrifices to the temple. And just a few steps away is the door to St. Anne’s church. Do you know who St. Anne is? I didn’t, but I’ve learned that she was Mary’s mother. If tradition is correct, the church stands just over (at least approximately so) the spot where her home had been. How about that? 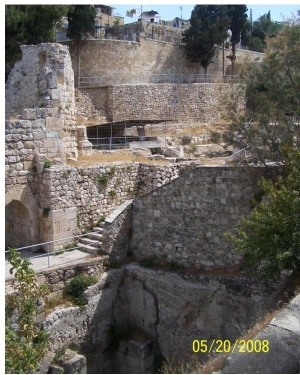 The pool of Bethesda was located in the neighborhood of Jesus’ grandmama’s house. Follow me now. For as long as Jesus could remember, this man had been lying there by the pool. When Jesus was a toddler, the man was there; when Jesus was playing stick ball with cousin John, the man was there; and when Jesus began his ministry, the man still lay there. “Do you want to be made well?” Jesus asks. And me? I’m not sure I do. Sometimes, often, I prefer lying by the pool watching others dive into the pool of wholeness. I prefer inaction. I prefer woe. Just for today, I’m going to try not to point out all the reasons why that’s hard and just say, “Yes.” How about you? What wonderful words of faith and acceptance. Jesus knows all of our shortcomings and still he continues to reach out his hand and ask. Grace--it's a wonderful thing isn't it?! Thanks so much for reading and commenting!